At the beginning of the season Ferrari revisited the blown wheelnut concept, a technical innovation that teams have flirted with since mid-2012. In fact, a number of teams have also re-installed their own versions on their cars at some stage this year, although generally we have seen them disappear again. The idea behind using them again is to try to regain the larger outwash effect of airflow around the front tyre, since it has been lost slightly due to the narrower front wings. Pushing airflow from the brake duct and out perpendicularly to the car is aimed at encouraging this effect although clearly it hasn’t worked as desired. Generally the teams have to open up the brake ducts a bit more, plus create a new set of pipework to funnel air separately from that going to cool the brakes themselves. However Ferrari have retained their large brake duct openings despite removing the blown wheelnut for some time now. This leaves us the question – that Andrea has rightfully asked – of why bother with the larger inlets? Afterall, they create a large blockage to oncoming airflow and they seem huge compared to their rivals’ solutions. My guess is that the larger inlet fairing is actually beneficial to the car’s aero around the front tyre, perhaps managing the front tyre wake more efficiently than a skinnier inlet would. It’s yet another unique characteristic that every car has and it all revolves around how the nose and front wing interact with eachother as air initially comes into contact with the car. The inlet will, however, create a bit of extra drag over something smaller. As of this year, the ‘monkey seat’ winglet at the back of the car – formally known as the Y100 winglet – has been increased in width, from 150mm overall to 200mm. The exhaust exit lies directly beneath and slightly behind the confinements of the winglet and we have seen a lot of development in this area so far this year. The reason for this development is because the exhaust gases have a profound effect on the efficiency of the rear wing above. I find it amusing how the FIA wanted to clamp down on exhaust gases controlling the aerodynamics at the rear of the car by moving the pipe exit to a “neutral” position, only for the teams to come up with yet another way of exploiting them. 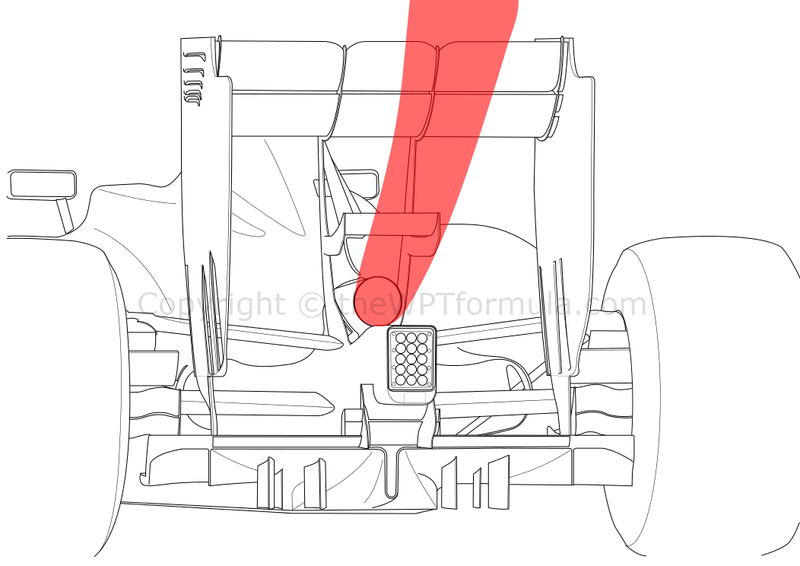 The natural course of airflow at the rear of the car is upwards, as this is where the upper and lower aero structures of the car combine – the floor and the wing surfaces. As a result the exhaust plume is also pulled upwards although it quickly wavers, particularly when going through corners. Like any wing, the rear wing has a maximum angle before it stalls. It stalls because airflow can no longer remain attached to the underside of the wing at a steep incline, so instead the air travels straight on and the low pressure area is removed. In 2014, there is a clear lack of rear downforce relative to 2013 levels so the teams have often run much bigger wings than you’d normally expect at most circuits this year. They will often run almost maximum wing angle and add a Gurney tab to induce a little extra upwash effect in order to regain the performance loss. This year’s power units provide more torque and a higher top speed over the departed naturally aspirated V8s, so to some extent there is little harm in running a larger wing angle. It is for this reason the teams have utilised the capabilities of the monkey seat winglet to produce even more downforce at the rear of the car. As the exhaust gases exit the pipe, they are naturally pulled upwards by the rear aerodynamics. Before the gases start to drift, the low pressure area on the underside of the winglet forces them to remain on an upward path towards the bottom of the rear wing’s central section. When the gases meet the underside of the wing they encourage the airflow passing beneath the wing to remain attached, thus reducing the likelihood of stalling and therefore enabling the ability to run an even higher wing angle. Mercedes, notably, have gone through various iterations of winglet throughout the season and there are other teams also making strides in this area. Lately we have seen Force India using an arched winglet to induce an outwash and upwash effect, all in the name of creating a little bit more rear downforce. A multitude of questions here from you, Stefan, so I’ll do my best to answer them all! Starting with the aero packages, I doubt we will see many new things from the lower teams simply because of their budget. They have absolutely blown through most of it rolling out a new car for this year thanks to the price of the power units and the development required to exploit them within the rest of the package. I would expect a team such as Sauber to bring the occasional new item, particularly as they have attracted recent investment from a Canadian billionaire. Their problems mainly revolve around braking and their brake-by-wire system has been a huge issue with the car. I do think that they can possibly nick a point or two this year, but the competition ahead of them is so tough that it is unlikely that they will break into the top 10. Say Mercedes grab a 1-2 each race, followed by a Red Bull or a Williams, then a McLaren and a Ferrari. You’d put your money on Force India to also get in there, then possibly a Toro Rosso and your points positions are full. On top of this I don’t believe either driver is of top calibre to pull the car up either, which is a shame. Since the FRIC ban not much has changed in terms of performance and that’s because the hardware has also remained virtually unchanged. To my knowledge all the mechanical components of the suspension have always remained, but the heave element on the front and rear suspensions was linked to their respective accumulators. These accumulators were disconnected and the main control valve in the middle of the car was removed, reducing weight but getting rid of some stability. In answer to your question, the teams have a lot of experience in setting up the heave spring and dampers to keep the car level in a corner and under braking, so nothing new has been put in place. Where FRIC was really effective was when there was a combination of both braking and turning (warp), such as China’s turn 1 or Malaysia’s penultimate corner. The cars do have to be run slightly stiffer now to prevent upsetting the aero too much but that only means a little bit of extra work for the driver when he gets on a kerb or a bump. 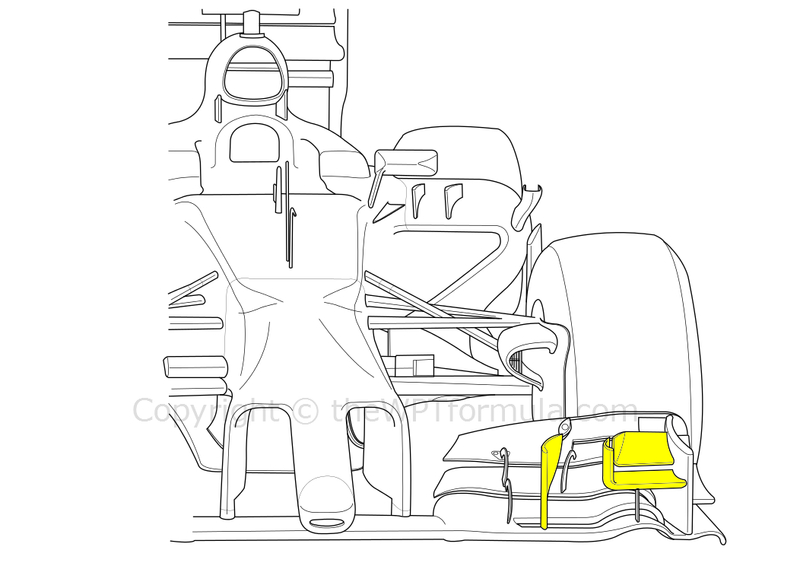 McLaren have benefited from the ban because their aero platform is based on a really stiff car, so I would imagine that FRIC barely made a difference for them. What’s a cascade winglet? ‘Cascade’ refers to the hanging definition of the word, as the winglet hangs off the inside of the front wing endplate. Thank you for all your questions! Please feel free to tweet me or comment on my Facebook page any queries or questions. I’ll be doing these regularly as I think they are quite useful – you tell me! 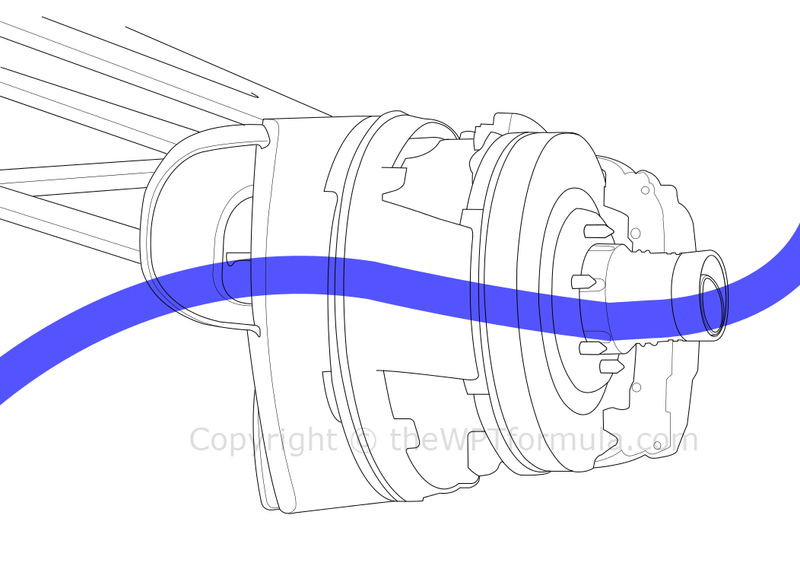 This entry was posted in Analysis, General and tagged brake, cascades, ducts, effect, exhaust, ferrari, follower, gases, monkey, questions, seat, winglet, y100 on September 14, 2014 by thewptformula.